What if my garbage disposer jams? Home/FAQ/What if my garbage disposer jams? This is a problem mostly experienced with our competitor’s products. They use induction motors which are slow starting and could jam if food is placed in the disposer before it is switched ON. Bio Shield disposers are designed not to jam by using permanent magnet motors. This motor produces high torque (twisting power) immediately when switched on. This feature prevents jams. In the unlikely event that a Bio Shield disposer jams, dejamming is very simple. 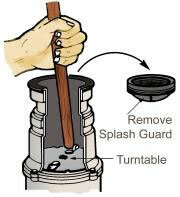 Turn off the switch to the disposer, check for foreign objects, dislodge the object by rotating the turntable with a long screwdriver or broom handle and remove the object.